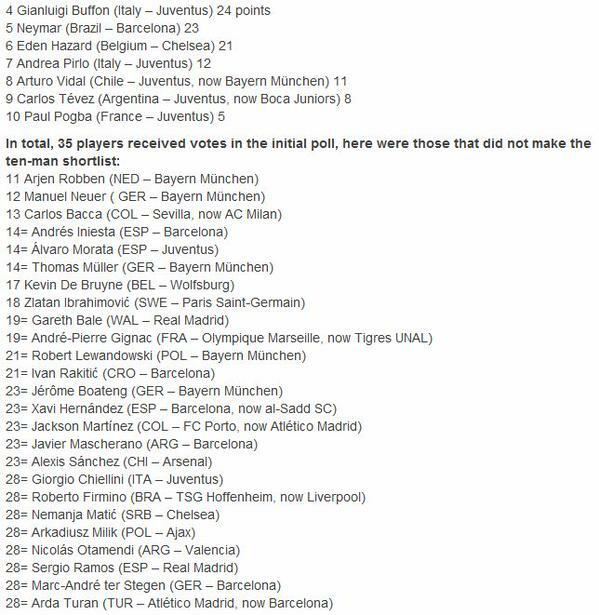 UEFA have named a 35-men shortlist for the “Best Player in Europe” award for the 2014/15 season. Usual suspects Lionel Messi and Cristiano Ronaldo along with Luis Suarez are among the top three nominated players while there has been a list of top 10 players prepared after the voting done by 54 journalists from UEFA countries. So far, points for Messi, Ronaldo and Suarez are yet to be revealed while players like Neymar, Eden Hazard and Paul Pogba make the Top 10 list for the best players in the world. Last year, it was Franck Ribery who was the third player to join Messi and Ronaldo and this season its Barcelona’s Luis Suarez. The Uruguayan striker enjoyed a tremendous debut season with Barcelona by scoring 22 goals and more than that providing 17 assists and going on his way to win a treble (La Liga, Champions League and Copa Del Ray) with Catalan side. Suarez was on the score-sheet in the Champions League final against Juventus and that was the case last night when Barcelona defeated Sevilla 5-4 in a thrilling UEFA Super Cup game to win their fourth trophy this year. Only player from the Premier League is Chelsea’s Eden Hazard, who was named PFA Player of the year after enjoying a League winning season and going on to score 14 goals and making 9 assists. Among the top 10 Best players in Europe, 5 players are from Juventus’s Champions League finalist side (Buffon, Pirlo, Tevez, Pogba and Pirlo).